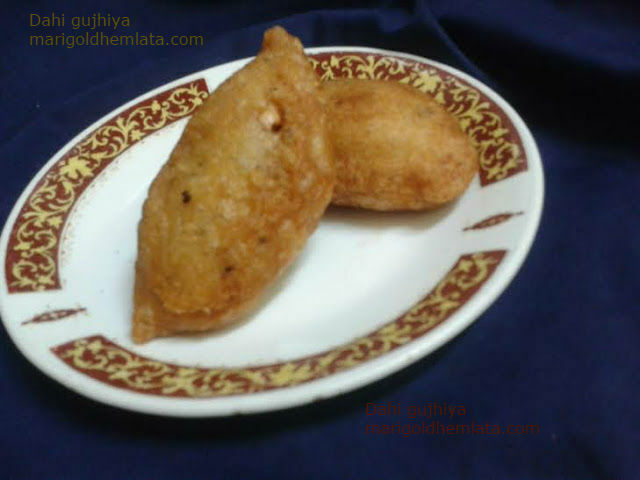 Dahi gujhiya is traditionally north Indian dish, dahi gujhiya is similar to dahi vada but the shape is like a gujhiya and it's filled with chopped nuts. mostly dahi gujhya made in festivals specially in holi. 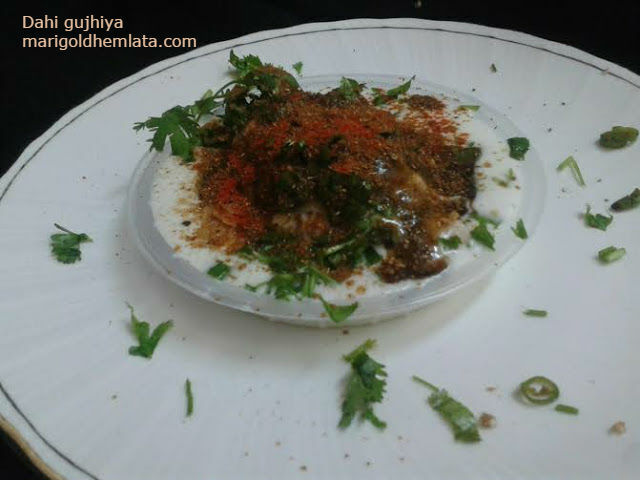 topping with khajoor imli ki meethi chutney, green chutney, roasted cumin powder etc. दही गुझिया एक उत्तर भारत की डिश है, डिश गुझिया दही वड़े की तरह ही बनाया जाता है इसे मेवा भरकर गुझिया की शेप में बनाया जाता है. ज्यादातर होली में बनाया और खिलाया जाता है पर किसी भी विशेष अवसर पर इसे बन सकते हैं. Clean wash and soak the lentil for 4 hours then remove the skin and drain well and put into mixer make a thick paste from the lentil by adding 1 tbsp water in it. Transfer the paste in a large bowl and add salt, asafoitida. beat the mixture with your hand or a spoon till the mixture become fluffy. Now take a large muslin cloth and wet its surface by applying water using your hand, wet both hands too. Take some paste roll it as a ball, place the ball over the wet muslin cloth and start pressing it with your hand, that it form a circle. Place some stuffing on one side of circle, leaving a space. 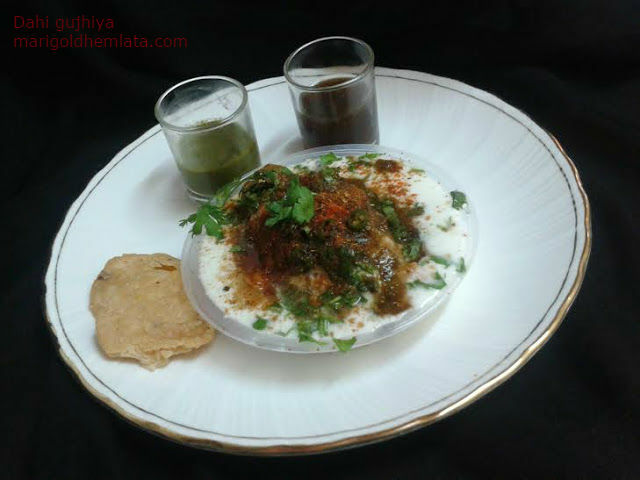 Join the edges of dahi gujhiya ir forms a semi circle shape. Now pick the gujhiya and gently slide in heated pan with oil in it on medium low flame. Fry the gujhiya till they are golden brown in color from all sides. Take warm water in a large bowl and add 1 tsp salt mix well. put the fried gujhiya into the warm water, soak them for 1/2 an hour. then take out the gujhiya and place between your hands and gently press it to remove excess water from it. In another large bowl add curd and sugar whisk them to form a smooth and creamy mix. Lets start the plating. put the sweetened curd in a serving bowl drizzle some green chutney, imli ki meethi chutney then pour some more sweetened curd, sprinkle some roasted cumin powder, red chili powder, green chili, coriander and crushed papdi.